Chulalongkorn University (Thai: จุฬาลงกรณ์มหาวิทยาลัย; rtgs: Chulalongkon Mahawitthayalai; [t͡ɕù.lāː.lōŋ.kɔ̄ːn má.hǎː.wít.tʰá.jāː.lāj]), abbreviated either CU or Chula (Thai: จุฬาฯ), is a public and autonomous research university in Bangkok, Thailand. It is ranked as Thailand's No. 1 university from various organizers such as QS world university ranking, Round university ranking, Center for world university ranking etc. The university was established in 1917, making it the oldest institute of higher education in Thailand. Chulalongkorn University is ranked as the top university in Thailand in many aspects of qualities covering the quality of the university itself, quality of students, quality of researches, quality in particular subjects, university reputation, environmental management systems. According to QS university ranking 2016. CU is placed 252nd in the world, 45th in Asia, 1st in Thailand, and 151-200 in the graduate employability ranking. The demands of officials specialized in various fields by the government in the late 19th century Siam was an result of King Chulalongkorn's bureaucratic reforms, which aimed to transform the feudal Thai society into a modernized state. In 1899, the king founded the Civil Service Training School near the northern gate of the Royal Palace. Those who graduated from the school would become royal pages. Being royal pages, they learned how to administer organizations by working closely with the king, which was a traditional way of entrance to Siamese bureaucracy. After being royal pages, they would then serve in the Mahattai Ministry or other government ministries. On April 1, 1902 the king thought the name of the school should be renamed to increase the dignity of students and graduates. Hence the name Royal Pages School (Thai: โรงเรียนมหาดเล็ก) was later used. Later, on January 1, 1911, King Vajiravudh renamed the school again to Civil Service College of King Chulalongkorn (Thai: โรงเรียนข้าราชการพลเรือนของพระบาทสมเด็จพระจุลจอมเกล้าเจ้าอยู่หัว) as a memorial to his father and moved the school to Windsor Palace (Thai: วังวินด์เซอร์ หรือวังใหม่) in the Pathumwan district. King Rama VI then realized that the education should be provided to all people not only for the bureaucrats. On March 26, 1917, the college was upgraded to the Chulalongkorn University (Thai: จุฬาลงกรณ์มหาวิทยาลัย), and the schools were transformed into four faculties: Faculty of Arts and Sciences, Faculty of Public Administration, Faculty of Engineering, and Faculty of Medicine. The university firstly granted certificates to its graduates. The education for a degree was then prepared. The Rockefeller Foundation reorganized the curriculum of the Faculty of Medicine. In 1923, the Faculty of Medicine became the first faculty to accept students from the secondary education (known as Mattayom). The remaining faculties then followed suit. After the 1932 Revolution, the Khana Ratsadon wanted the legal and political studies to be independent of "royalists'" Chulalongkorn University so they took the Faculty of Law and Political Science into their new Thammasat University in 1933. In 1938, the Chulalongkorn University's Preparatory School was founded to provide pre-collegiate education for its students. Those who managed to enter the university had to spend two years in the Preparatory School before going on to the Faculty of Arts and Sciences. The Preparatory School, however, ceased to be a university-owned preparatory school in 1947 and became independent Triam Udom Suksa School. Later, the university established Chulalongkorn University Demonstration School (CUD) system as laboratory primary and high schools for Faculty of Education. Since the establishment of the Royal Pages School, the former name of the university, Chulalongkorn authorized the use of his personal emblem as school emblem. 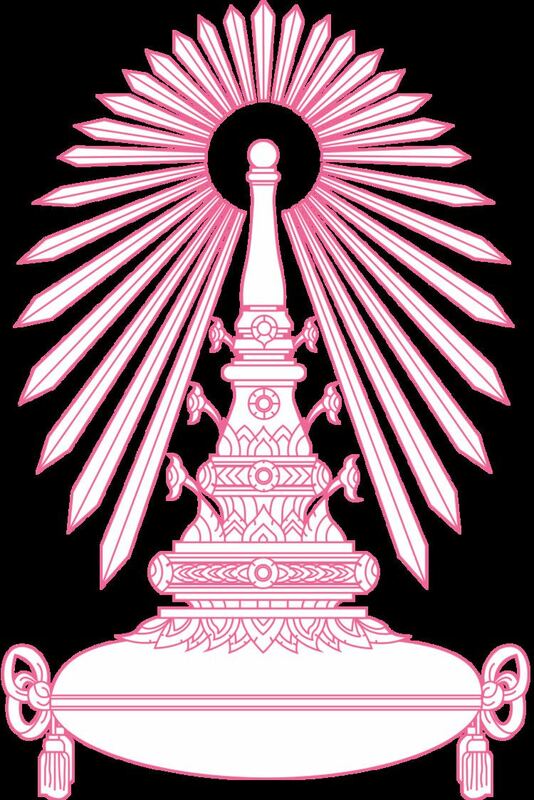 The emblem is 'Phra Kiao', or Thai style coronet which is made to fit hair topknot. As the school was transformed into the university, the King of Thailand authorized the use of Phra Kiao until nowadays. Today, Phra Kiao is used in formal letters, transcripts, souvenirs made by the university and student uniforms. Undergraduate students are required to wear the uniform as they are studying, taking examinations and contacting the university. For graduate students, collared or polo shirt and dark trousers are required for male students while plain blouse with a properly long skirt are required for female students. Originally, the university uniform was adapted from uniform worn by Chulalongkorn's heirs. Later, the uniform was changed into more modernized version but the original one is reserved as a formal uniform. Formal uniform is usually worn by student leaders and bachelor graduates. Today, the normal uniform for male undergraduate students are the plain white shirt with long or short sleeves and black (or dark blue) trousers. Dark blue necktie with colored Phra Kiao in its front is required for first-year students but optional for higher years. However, black tie with silver Phra Kiao pin is usually used by higher year students in some faculties. For female students, they are required to wear a short-sleeved blouse with a fold along the spine. The buttons must be made of metal and Phra Kiao emblem must be pinned on right chest. Slightly dark blue or black pleated skirt and any black, white, brown shoes that conceal heels are also required. For female first year students, white leather shoes are required. Chulalongkorn University's uniform has long been the template of uniforms used in other universities in Thailand. The academic dress of Chulalongkorn University is based on ceremonial attire called suea krui, which is long-sleeved robe made of very fine mesh. Like dresses worn in the United Kingdom, the robe is open-fronted and calf-length. Cap and hood, however, are omitted. Colored felt strip decorated with gold-colored ribbons is attached to the margin of the gown including elbow and wrist. Bachelor and master students use the black strip, while respective scarlet and pink are for doctors (including honorary degrees recipients) and lecturers. Yellow strip is specially used for the king of Thailand. Rain tree is very common on the university campus. It was deeply associated with the university since the past. Fresh green leaves in the beginning of the semester represent freshmen's enjoyment. As the tree produces slimy pods and sheds leaves, the below ground becomes dirty and slippery. As a simile, it is described as a warning to students to be ready for examination. When they walk carefully, they do not slip (able to pass examination). Whereas if they walk carelessly, they would slip and get injured (unable to pass examination). Around 1937–1957, many rain trees were to be cut down to allocate the area for new buildings and enhance cleanliness. The King Bhumibol Adulyadej recognized the dramatic decrease in the number of rain trees. Hence on January 15, 1962, the king planted five trees that he brought from Hua Hin in front of the university auditorium and said: "Hence I give these five trees as eternal memorial" (Thai: จึงขอฝากต้นไม้ไว้ห้าต้นให้เป็นเครื่องเตือนใจตลอดกาล). Chulalongkorn University consists of 19 faculties, 3 colleges, 1 school and many institutes which function as a teaching and researching unit. In 1917, the university had four faculties: Arts and Sciences, Public Administration, Engineering and Medicine. The Faculty of Law was established in 1933 as part of the Faculty of Law and Political Science. During the 1930s to the 1950s it expanded to various fields including Pharmacy (1934), Veterinary Science (1935), Architecture (1939), Dentistry (1940), and Commerce and Accountancy (1943). In 1943, the regency government under General Phibun separated the Faculty of Medicine, Dentistry, Pharmacy, and Veterinary Science to become the University of Medical Sciences (now Mahidol University). In 1948, the Faculty of Political Science was re-established. The Faculty of Education was established in 1957 from the School of Teacher Training at Baan Somdet Chao Phraya (Thai: โรงเรียนฝึกหัดครู บ้านสมเด็จเจ้าพระยา). In 1967, the Faculty of Veterinary Science was returned from Kasetsart University and the Faculty of Medicine at Chulalongkorn Hospital was moved from University of Medical Sciences to Chulalongkorn University. In 1972, the Faculty of Dentistry and Faculty of Pharmacy were retrieved. Office of Commission on Agricultural Resource Education (OCARE) was established in 2009. It is actually not administration office but the school in which teaching and research are carried out. It intakes students from two groups: one from Northern Thailand provinces (Nan, Phayao, Phrae, Uttaradit) and another from the rest of country. It has been upgraded into School of Agricultural Resources with full degree-granting power by university council on 5 March 2014. The other research supporting organization. The Unisearch purposes to promote academic staffs and researchers to publish their researches and The Intellectual Property Institute purposes to help the researchers register their patents. CU also supports endowments to set up Research Units(RU) and Center of Excellence(CE). Nowadays, CU has over 100 research units and 20 national Center of Excellence. In the Center for World University Ranking or CWUR, Chulalongkorn is ranked as number 1 university in Thailand and 320th in world rankings in 2016, considered by alumni, researches, quality of curriculums and instructors. In the Round University Ranking 2016. Chulalongkorn is ranked the 1st in Thailand and ranked 424th in the world. In the U.S. News. Chulalongkorn is ranked 579th in the world. considered by the university's reputation, medium, citations, international cooperation, the quantity of Ph.D. students, etc. The Webometric ranking indicates quantity and quality of the university's medium, considered by being searched by search engines, online documents, and citations in Google Scholar. Chulalongkorn is ranked 452th in the world. The University is host to 40 student clubs, including the Buddhism and Traditions Club, the Religious Studies Club, the Mind Study Club, and the Thai Classical Music Club. Chulalongkorn also have a Morals Network, which actively campaigns to protect student activities from damaging the university's reputation. The University's Cheer Club annually organizes the Chula-Thammasat traditional football match.